FastGlacier - Getting Started Guide. First run. How to start using Amazon Glacier with FastGlacier. FastGlacier - Getting Started Guide. How to start using Amazon Glacier. In this tutorial we assume that you have signed up for Amazon Glacier Service and downloaded and installed FastGlacier. 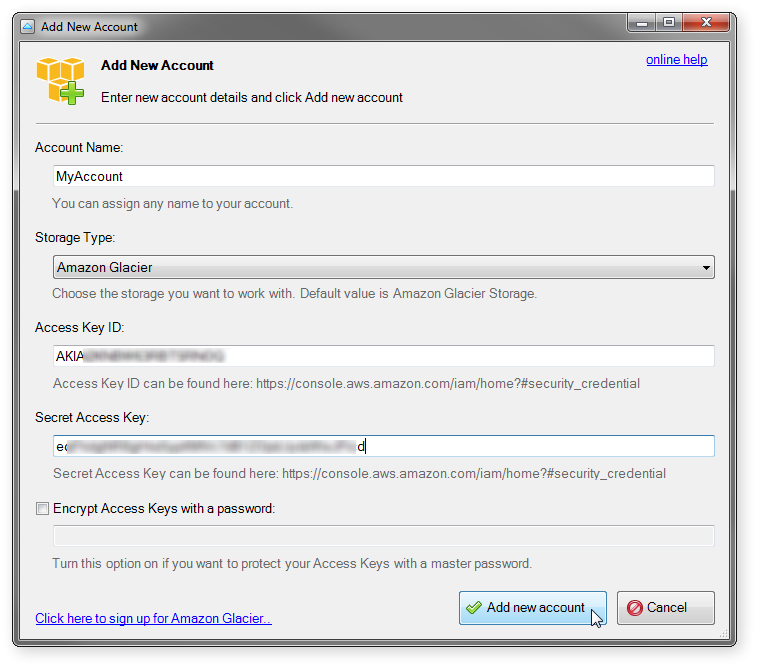 When you start FastGlacier for the first time, you will be asked to add new Amazon Glacier account. You will be asked to add a new Amazon Glacier Account when you start FastGlacier for the first time. 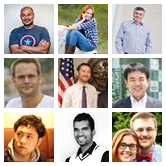 Account Name - You can assign any name to your Amazon Glacier account. Encrypt Access Keys with a password - Turn this option on if you want to protect your Access Key ID and Secret Access Key with a master password. Click Add new account. Now you are ready to start working with FastGlacier. All files on Amazon Glacier are stored in top-level containers called a 'vaults'. You need to create at least one vault before uploading your files to Amazon Glacier. Click here to learn how to create an Amazon Glacier Vault. Once you have created a new vault, you can start uploading your files to Amazon Glacier. The Vaults section is located on the left hand side of the main window. The Vaults section displays a list of vaults in selected region. The Vaults section displays a list of vaults in selected region. You can create up to 1000 vaults per region. Using the New, Delete and Refresh buttons you can create and delete vaults, and refresh vaults list. The Files section is located on the right hand side of the main window. 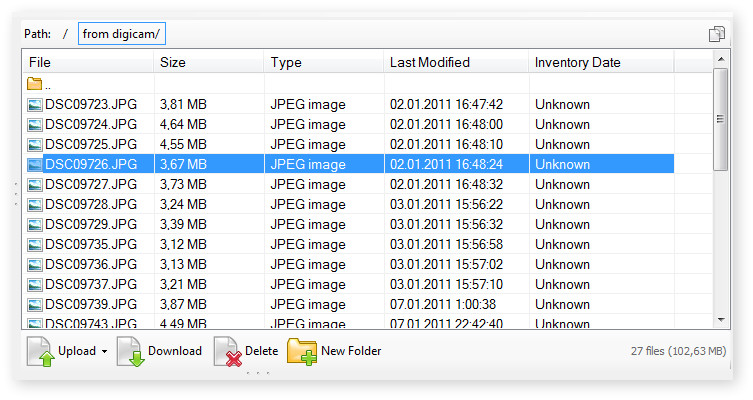 The Files section displays a list of files in selected vault. 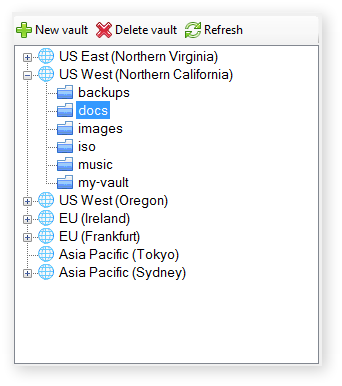 The Files section displays a list of files and folders in selected vault. 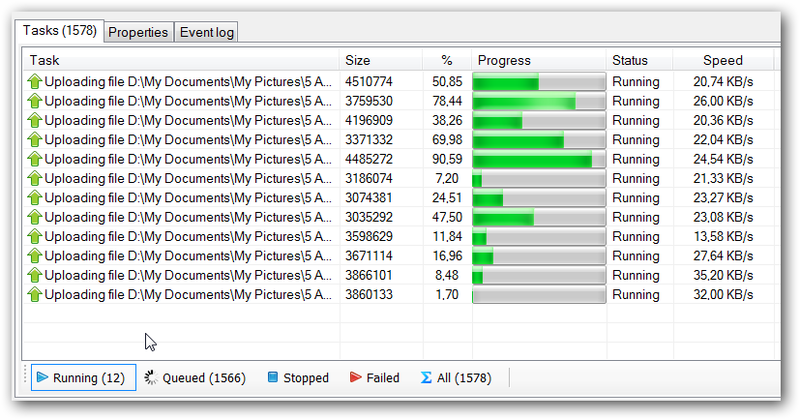 Click the Download button to download selected files and folders to your local disk. Click the Delete button to delete selected files and folders. 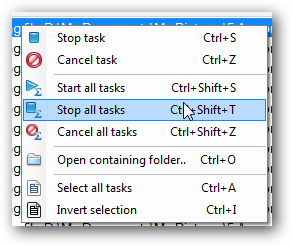 The Tasks tab displays the running, queued, stopped and failed tasks. 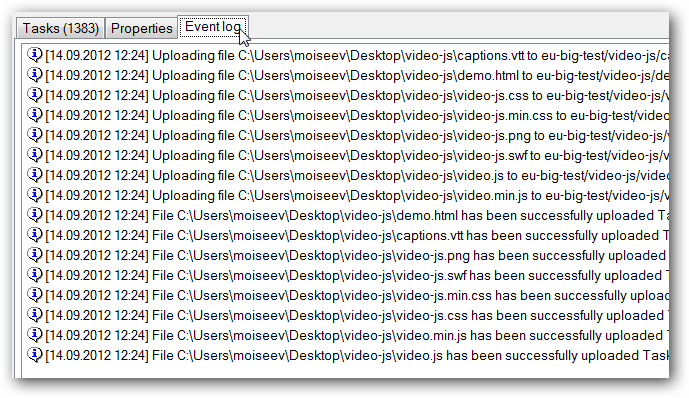 The Tasks tab displays a list of running, queued, stopped and failed tasks. The Properties tab displays the properties of selected vault or file. The Event log tab displays last 1000 log messages. You can configure logging settings in Tools -> Options -> Logging.